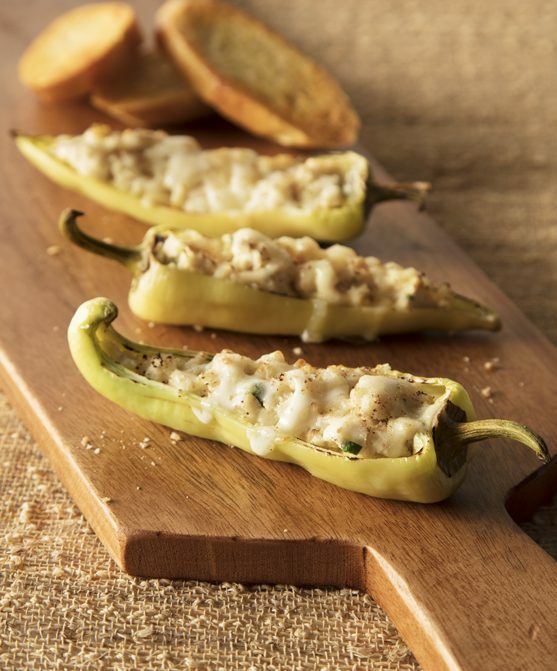 Made with banana peppers, cheese, and some ingredients you probably already have on hand, these ricotta stuffed hot peppers are simple and delicious crowd-pleasers! Cut off tops of banana peppers or cut peppers lengthwise and remove cores. In bowl mix Ricotta cheese, 8oz. mozzarella, bread crumbs, parsley, salt, and pepper. Roll cheese, mix into log shape, and insert into peppers. Top with remaining shredded mozzarella. Place on cookie tray covered with oil and bake at 400 degrees F until banana peppers look roasted and cheese is melted. Make it Meaty: Want to mix things up? Add some Italian sausage for additional flavor! Simply brown the sausage and work into the cheese mixture before inserting into banana peppers. Did Somebody say leftovers? If you use up the Ricotta cheese and find yourself with extra banana peppers, store them! Raw banana peppers usually keep for well for one week in the refrigerator and can also be sliced and frozen in airtight containers or freezer bags.